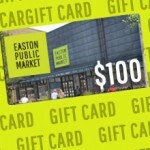 Please note that the purchase of EPM gift cards will be suspended on Sunday April 14th at 5 pm and will be back online and at the gift card kiosk located at the Easton Public market in approximately one week. Check back here to confirm their availability and thank you for your patience until this feature is reactivated. In the meantime you can still purchase Downtown Gift Cards that can be used at all EPM vendors. Whether you need a gift idea for a friend or family member — or simply prefer an easier way to make purchases from your favorite market merchant — the Easton Public Market Gift Card is a thoughtful gift for the foodie in your life! Accepted at each of EPM’s vendors, the EPM Gift Card can also be used for cooking classes and EPM merchandise. The Easton Public Market is located at 325 Northampton Street, Easton, PA 18042.